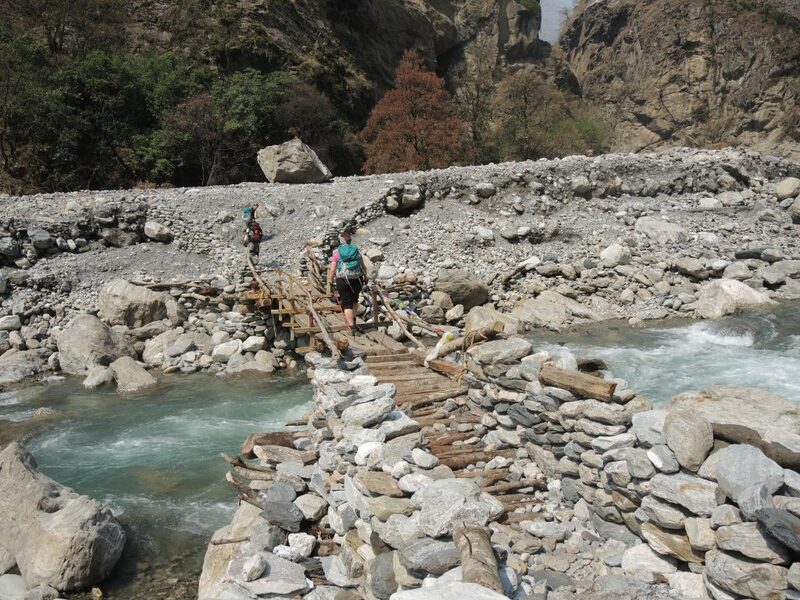 This trek is an introduction to everything that the Himalaya has to offer. 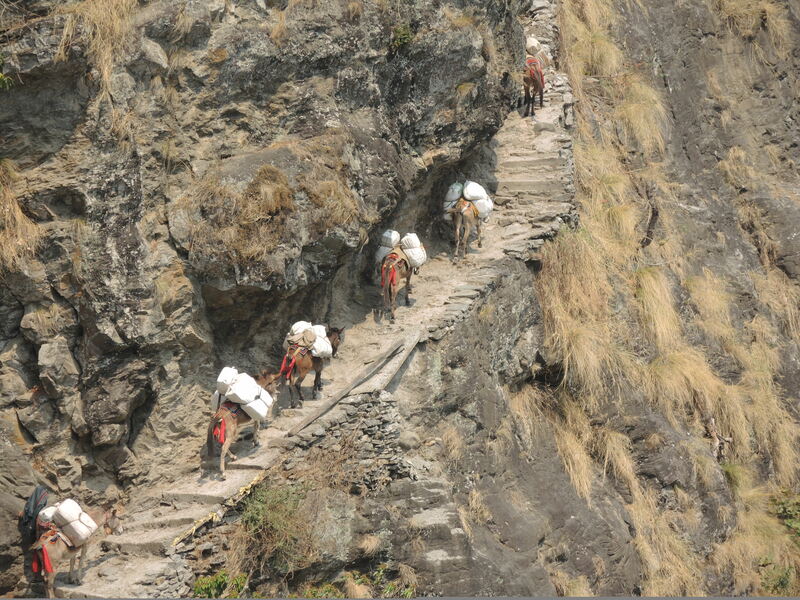 We experience life on this trek in the way in which it has been lived in the Himalaya for hundreds of years. 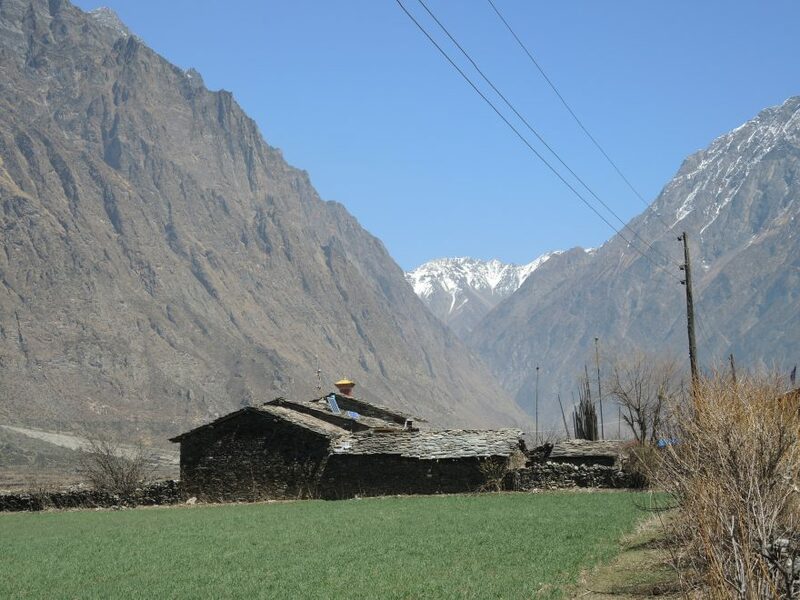 We walk through the sacred Tsum Valley and its small villages and traditional monasteries surrounded by mountain peaks up to 6,000 and 7,000 meters. 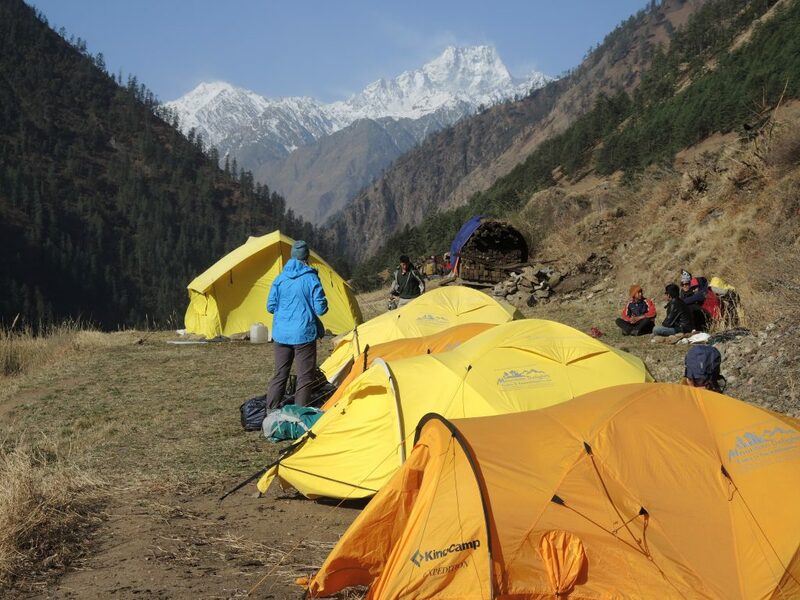 During our trek, we overnight in tents in order to gain the extraordinary experience of being on a camping trek in Nepal. We are also joined by our own porters, cook and guide, who show us, first-hand, the hospitality of the Nepali people. The isolated Tsum Valley is populated by Tibetan Buddhists, called Tsumbas, which means “diversity” in the Tibetan language. 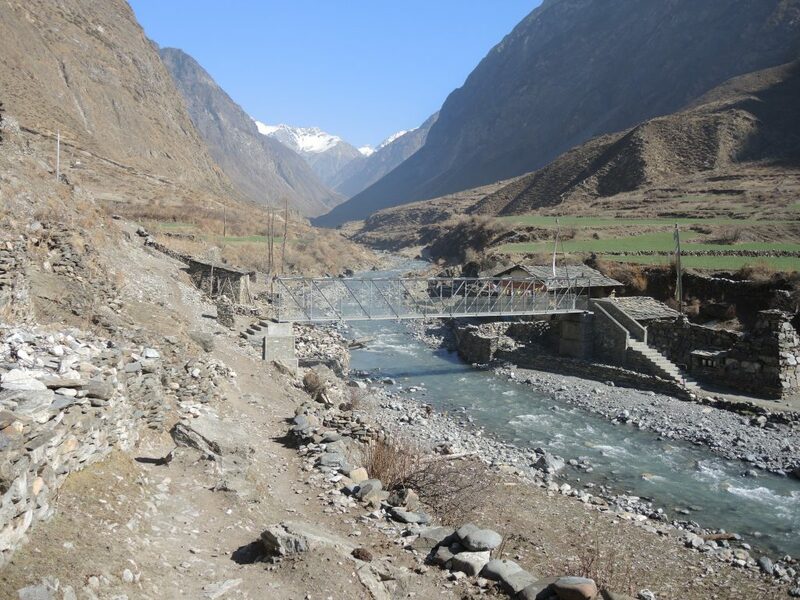 The Tsum Valley lies on the border of Tibet and was closed to tourists until 2008. 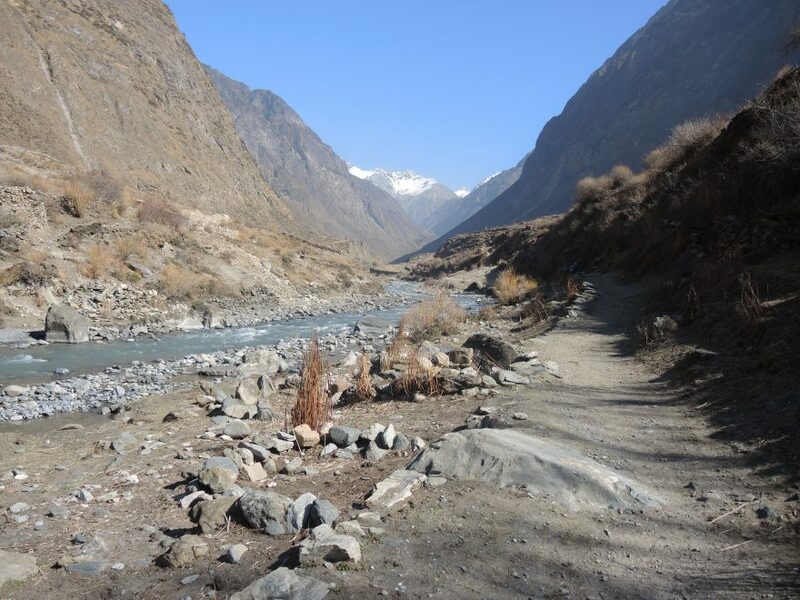 The Tsum Valley trail is truly a special place and a trek that is distinct in many ways. Environmentally, the area is idyllic. The rugged and off-the-beaten path trail offers charming natural views of pine and rhododendron forests, birds and wildlife and takes us through green hills and terraced fields with spectacular Himalayan panoramas of Ganesh Himal, Manaslu and the Tibetan mountain ranges. Another stunning aspect of the Tsum Valley is the unique art, culture and lifestyle. 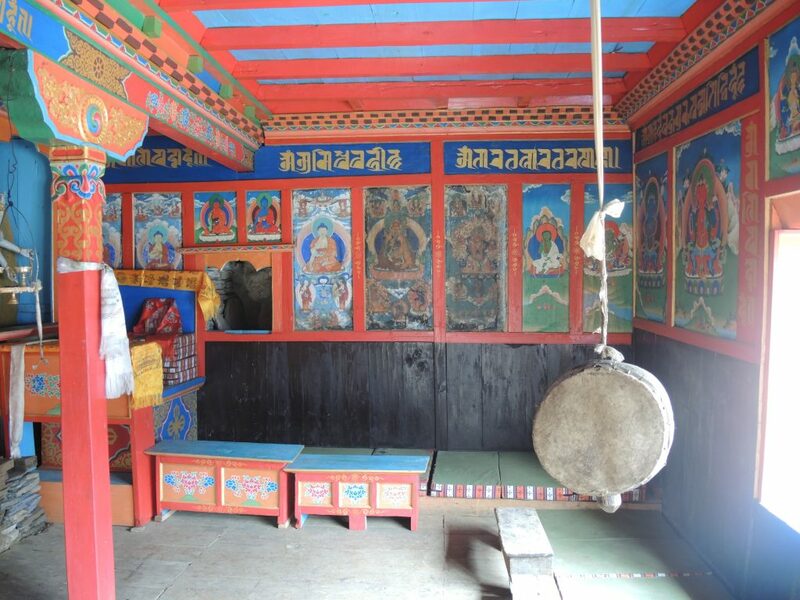 The Tibetan Buddhist monasteries, like Mu Gompa, Rachen Gompa, Milarepa cave and other cultural sites offer a mystical atmosphere to Tsum Valley. The highest altitude we sleep at during our stay is on Day 10 at Mu Gompa (3,700 meters). 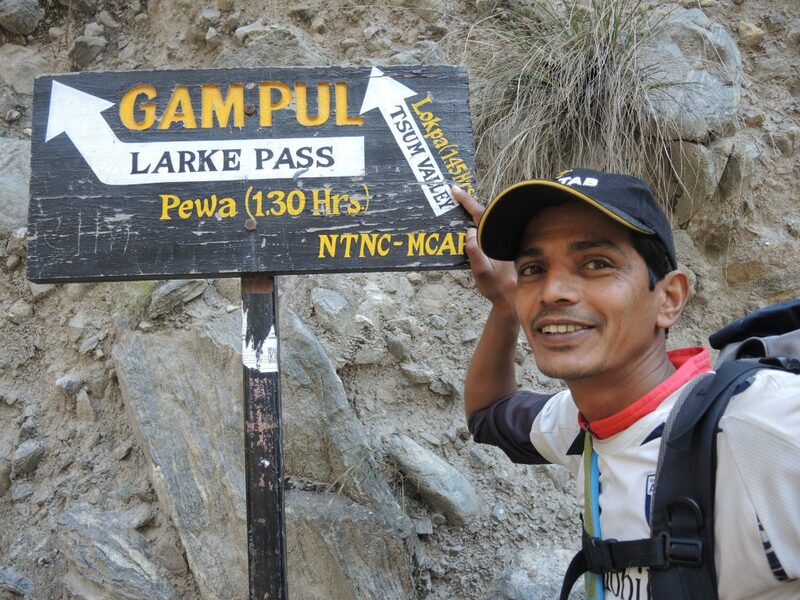 The trek has relative long hiking days and, therefore, is a trek for people who train regularly. We carry only a light daypack, as we have porters to carry most of our luggage. This trek is suitable for people with little experience at high altitudes. We have customized the daily distances to make the acclimatization as comfortable as possible. 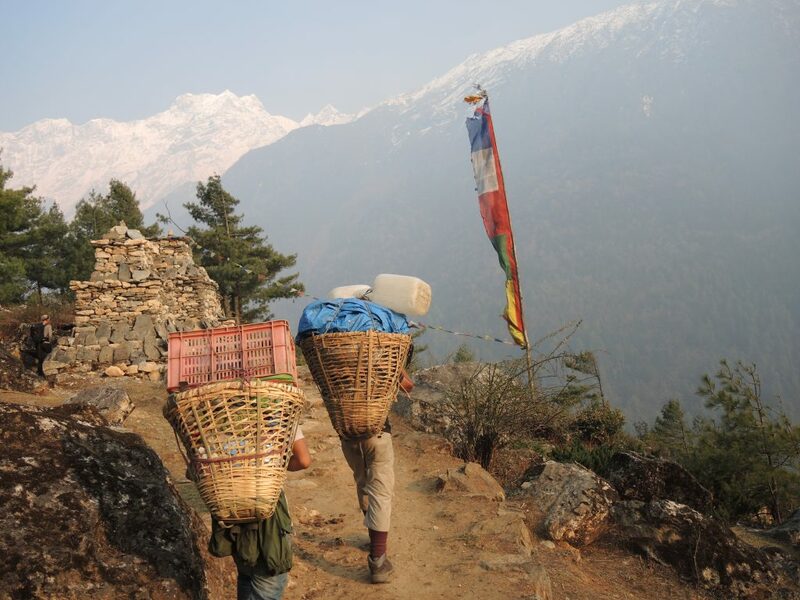 Please note: The Tsum Valley trek is most suitable for people who are used to spending time in nature and are capable of participating in multiple consecutive strenuous trekking days of up to 7 hours each. If you want to book this trek, please send an e-mail to ingvill@livealifeinmotion.com. Before booking a trek with us, we recommend that you please first read our terms and conditions. Please contact us if you have any questions or want more information about our treks. Live A Life In Motion wants to contribute to maintain the settlements in the areas in which we organize treks. Therefore, Live A Life In Motion donates $115 US Dollar per participant on our treks to a school project. A representative from our local partner greets you at Tribhuvan International Airport in Kathmandu and transfers you to your hotel. Your time during the day is not planned, so you can explore the tourist area Thamel on your own. In the evening, we meet together with our local representative, Ram, for dinner. Ram is a successful businessman and social entrepreneur, who has done a tremendous amount of work helping the survivors of the April and May 2015 earthquakes in Nepal. After a short informational meeting about our trek, Ram tells us about the relief work he has been involved in since the earthquakes struck Nepal last year. After breakfast, we drive to one of the Tibetan neighborhoods in Kathmandu, Boudhanath, to begin our sightseeing. We tour the small Buddhist monasteries in the area surrounding the famous Boudhanath Stupa. 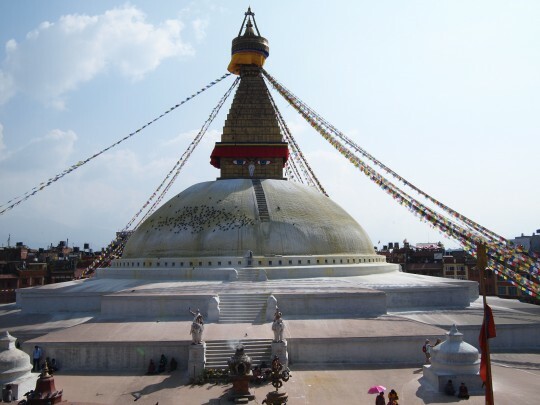 Located in East Kathmandu, the Boudhanath Stupa is one of the largest stupas in the world. It stands with four pairs of eyes in the four prime directions keeping watch for virtuous behavior and human success. 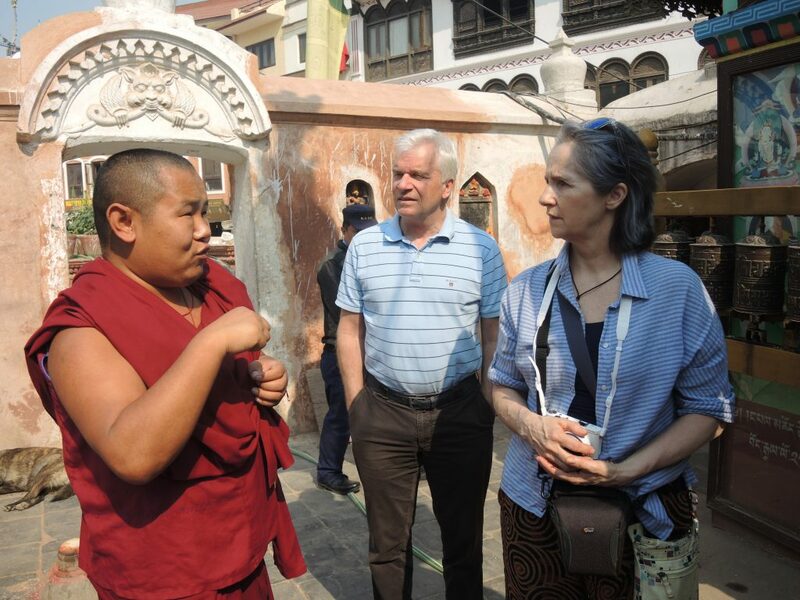 We continue our walk through the streets of Boudhanath and continue to the traditional neighborhood of Kopan on our way to the Kopan Monastery, which is situated on a hillside on the outskirts of Kathmandu. Following a guided tour of the monastery by one of the monks, we eat lunch in the visitor’s restaurant, where we enjoy one of the best views of Kathmandu. 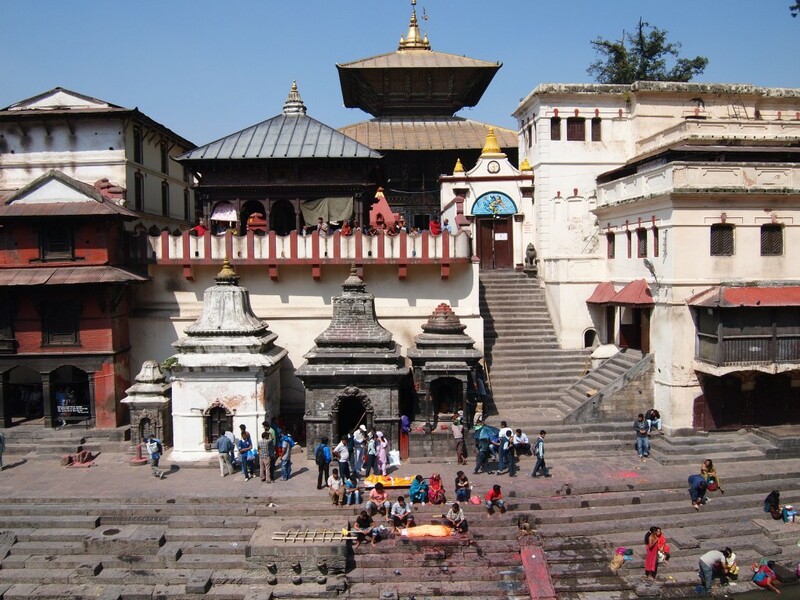 After lunch, we drive to the famous Pashupatinath Temple and walk around its grounds. Pashupatinath Temple is a Hindu temple devoted to Lord Shiva located beside the Bagmati River. It is one of the most significant temples for Hindu devotees around the world. The golden pagoda temple is richly carved with silver doors. During Maha Shivaratri, which is held every February/March, a big fair is held around the temple. Both Pashupatinath Temple and Boudhanath Stupa are UNESCO World Heritage sites. After visiting Pashupatinath Temple, we return to our hotel, where Maria will give us an introduction to Ishayas’ Ascension meditation. She will also teach us our first meditation technique. The rest of the evening is free. After breakfast, we drive to Soti Khola. Our drive starts out on the Prithvi Highway, which offers us incredible views along its winding road and takes us to the Trishuli River bed. From there, the road splits to the countryside and gets rougher and more bumpy. We reach Soti Khola after a 8-9 hour drive via the district center of Dhading. 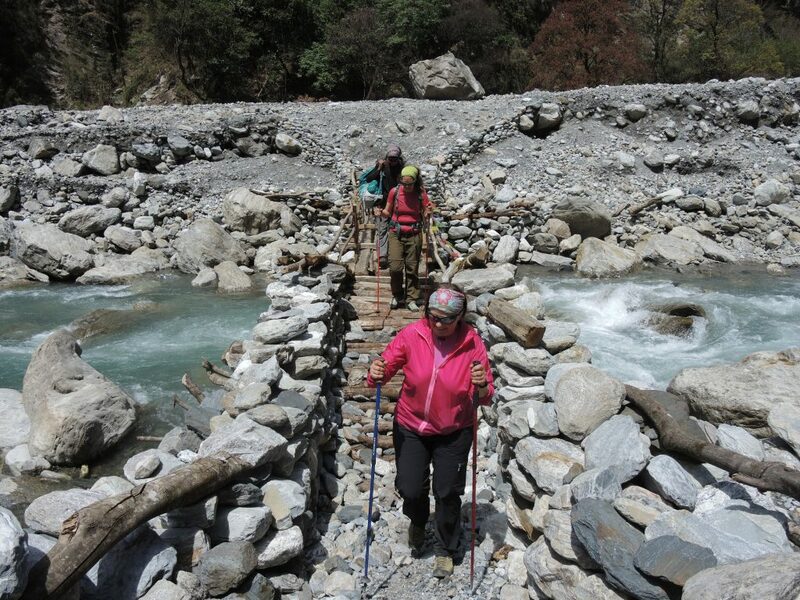 We start on the Manaslu Circuit trek trail, which we will follow for the next days before we turn off the trail and start on the Tsum Valley trek. Today’s walk starts through the village Soti Khola before we continue on a narrow path along the mountainside, where we share the path with mules (or as the locals call them “mountain motorbikes,”) which is the local transportation used to transport goods up to the remote villages in Manaslu. 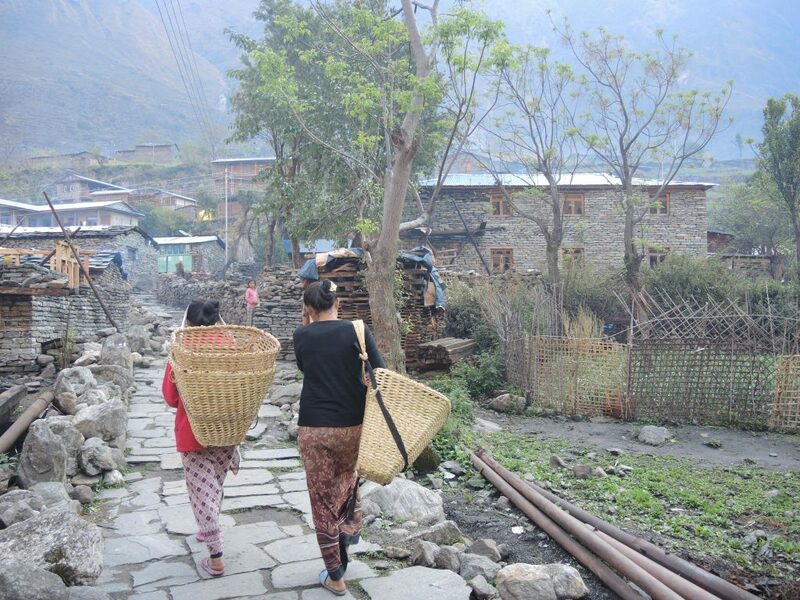 We walk in the valley along the Gandaki River with high mountains on both sides and small villages upon the mountainside. We walk through small villages and start to ascend until we reach Khanibesi, where we stop and eat lunch. After lunch we continue our walk on a riverbank before we reach the village Machakola, which is our campsite tonight. We continue on our trek that leads us to Jagat. The first village we arrive in is Tatopani, which is known for its hot springs. We continue our walk in similar landscape as yesterday until we reach Dobhan, where the kitchen staff prepares lunch for us. Afterwards, we start our walk through some rocky parts, a forest and on a riverbank, before we arrive in Jagat Village, where we set up the campsite for the night. We start the day with breakfast before we start on our way to Lokpa. Today we will turn off the Manaslu Circuit trek’s trail and start on the trail that will take us up to the last settlement in Tsum Valley, Mu Gompa. It is lively on the trail with a combination of tourists, local villagers, caravans with mules and herders with sheep and goats. We start the trek on narrow paths along the riverbank before we come to a suspension bridge where we cross the river and continue up the hillside to Phillim Village. 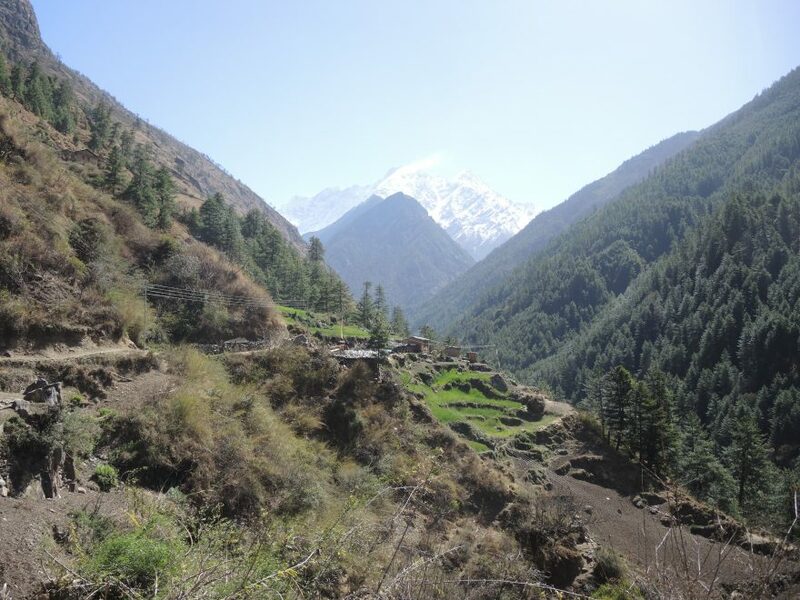 We continue through Phillim to the other side of the village, where we continue to walk on narrow paths on the hillside until we come to the crossroad, where we turn off the Manaslu Circuit trek’s trail toward Lokpa and Tsum Valley. 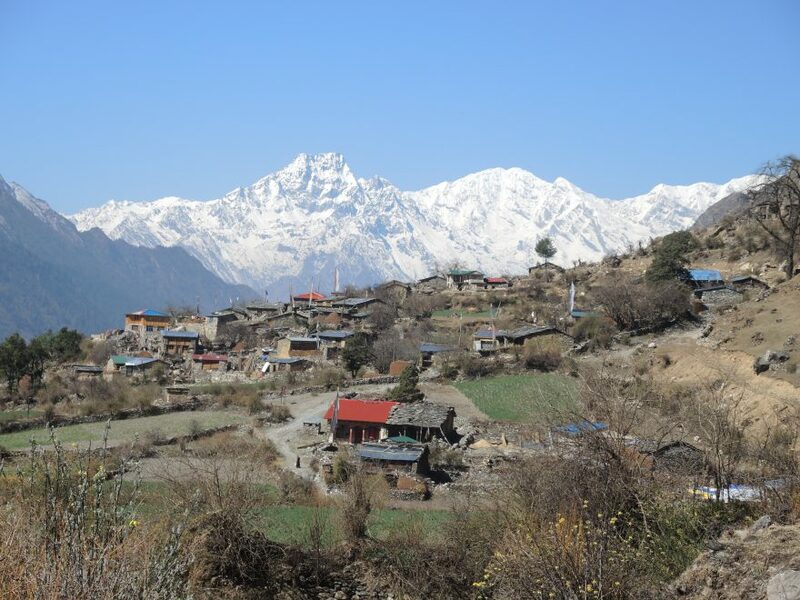 We can now see the Manaslu mountain range for the first time on our trek. 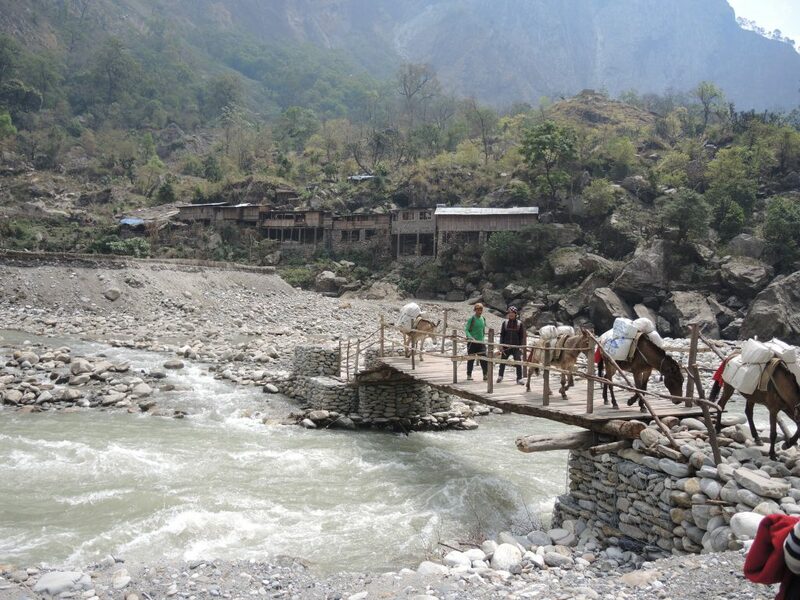 We reach Lokpa, a beautiful small village, before lunch, and we will stay there for the night. From Lokpa we start today by walking downhill until we reach the riverbank. We cross the river before starting on a long hill upwards. This distance continues with descents and ascents until we reach the suspension bridge before the last long uphill that takes us to our campsite in Chumling. 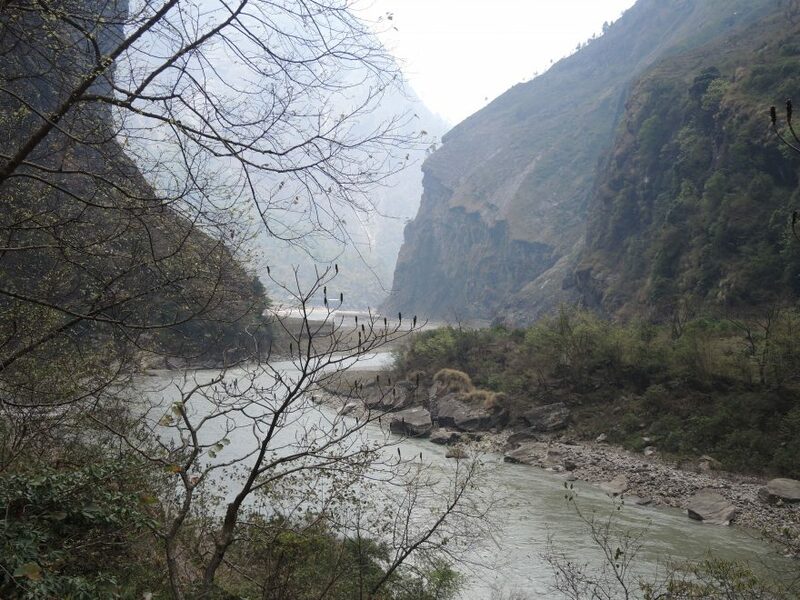 The landscape we pass along the way is wild, with a rocky riverbank, where the river Urgin Khola and Siyar Khola meet. When we reach this river convergence, the lower part of Tsum Valley reveals itself with high mountain ranges on both sides and a narrow green valley with small villages. This is the heart of the Tsum Valley. 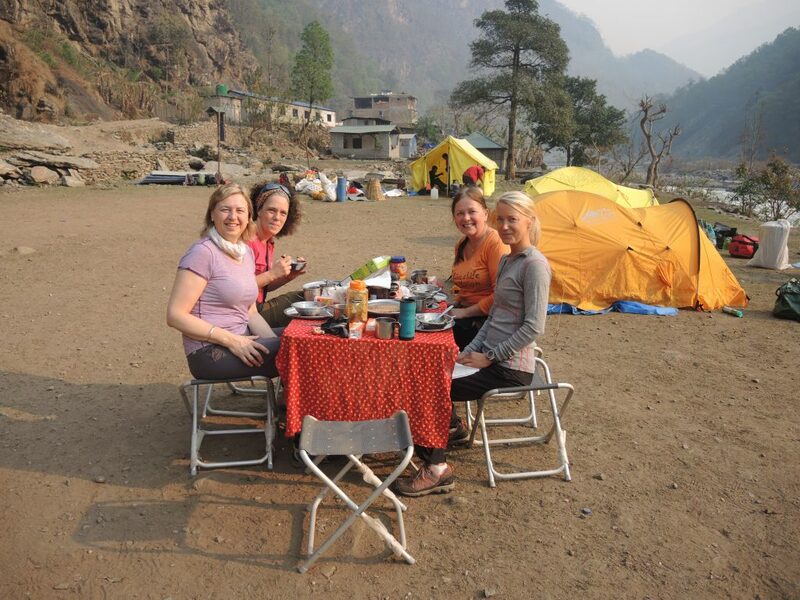 We have lunch when we reach our campsite, where we have a beautiful view of the Manaslu, Ganesh Himal and Tibetan mountain ranges. Today’s distance is not our longest on the trek but it’s definitely the hardest. We wake up before dawn and watch the sunrise over the mountains of Ganesh Himal range. Life is beautiful. Today’s walk starts with a slight downhill in a green valley, surrounded by mountain peaks up to 7,000 meters on both sides. We stop for lunch before we start on a long hill to our end destination for the day, Chhokang. When we arrive in Chhokang, a new type scenery reveals itself to us. After walking through a narrow valley for the entire day, the landscape changes into a wide valley. We spend the afternoon exploring everyday life in Chhokang village – its narrow alleyways, friendly people and horses roaming freely around the heart of the village. This day’s walk is in an open landscape, where we will be walking through farming fields and experience how the villagers plow their fields the way they have done it for hundreds of years – with yaks (mountain cows) and a wooden plow. We have lunch close to the monastery, Rachhen Gompa, before we continue on our walk to the small mountain village Nile, which lies at the end of the wide valley we have been walking in all day. When we reach Nile, we have the mystery of the high mountains of Himalaya in front of us. We have now reached the second last settlement in the valley. the Buddhist monastery of Mu Gompa. The valley changes itself again to the landscape of that in high mountains, rocky paths and landscape. We reach the campsite underneath the monastery before lunch. It’s a beautiful place with a peaceful atmosphere. We eat lunch and visit the monastery Mu Gompa in the afternoon. We get up early in the morning to walk up to a viewpoint behind our camp at 4,000 meters to watch the sun rise over the mountaintops of the Himalaya. The group splits into two after having seen the sunrise and beautiful view from this viewpoint. Some will continue up to the hilltop above at 4,800 meters. The other group will descend to the campsite again, where those, who wish to do so, can enjoy a cup of freshly brewed coffee before breakfast. We relax for the rest of the day in these beautiful surroundings. From Mu Gompa, we trek gradually down to Lamagoan. We stop in Chhule village for lunch. We will visit the nunnery Ginhgye Gompa on the hillside over Chhule, while the kitchen staff is preparing lunch for us. Ginhgye Gompa is a small monastery school for young girls as young as 8-9 years old from poor families in the villages nearby. After lunch, we continue down the valley through farming fields until we reach Lamagoan village. After breakfast, we visit one of Milarepa’s meditation caves, just a few minute’s walk above the village along the mountainside. Milrepa (1052 – 1135 AD) was a famous yogi and poet within the Tibetan Buddhist philosophy, who lived in different meditation caves in the Himalaya. After visiting the cave, we continue to walk down the valley to Chumling, where we stayed on Day 8. We start the day on the beautiful path between Chumling and Lokpa, which we also walked on our way up the valley on Day 7. After a distance with a lot of ascents and descents, we stop and have lunch in Lokpa. After lunch, we leave the Tsum Valley trail and continue on Manaslu Circuit trek trail in the direction of our start and end destination for the trek Soti Kola. After a light two-hour walk, we reach the village of Philim, where we set up camp for the night and enjoy the beautiful view of the valley. We get up, have breakfast and start on our way back to Machakola, where we had our camp on Day 4. We start our walk by descending down to the riverbank to the suspension bridge, where we cross the river and continue down to Jagat, before having lunch in Dobhan. After lunch, we pass through Tatopani, where it is possible to have a bath in the natural hot spring. Later, we reach Machakola village, where we have our campsite for the night. The beginning of our trek today— the last day of our trek – takes us along a riverbank, before we start to ascend the hillside and through a terraced farmland, where we reach Khanibesi and stop for lunch. After lunch, we descend to the riverbank again before we ascend the narrow mountain path that brings us back to our end destination for the trek, Soti Kola. 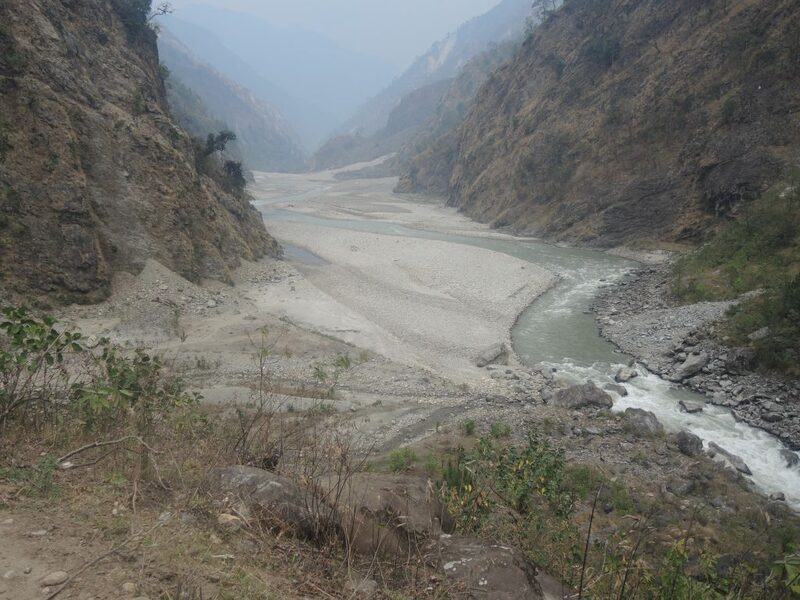 We drive to Kathmandu from the Soti Khola via Aarughat. From the district center of Dhading, Dhading Besi, the road joins us again to the beautiful Prithvi Highway en route to our return to Kathmandu. We transfer to our hotel in Kathmandu, where we stay tonight, before meeting for our last dinner together in a nice restaurant in Kathmandu. 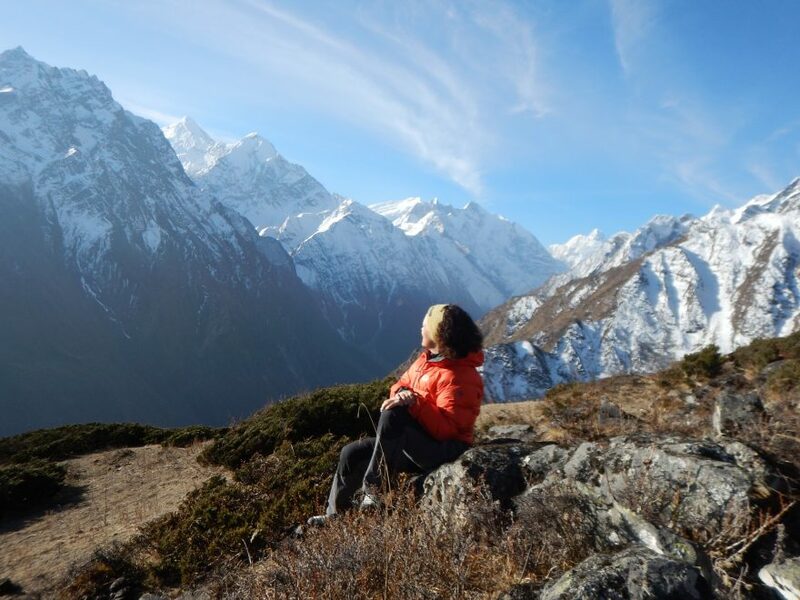 In 2013 and 2014, Ingvill journeyed to Asia, where she spent ten months in Nepal and six months in the Himalaya on treks and climbing expeditions as well as visits to remote sherpa villages. Her first trek was the classic Everest Base Camp. In November 2013, Ingvill summited one of the classical mountains in the Everest region named Ama Dablam (6,812 meters). She returned to the Everest region in Nepal in 2014 and 2015 with the goal of climbing the world’s highest mountain, Mount Everest (8,848 m). 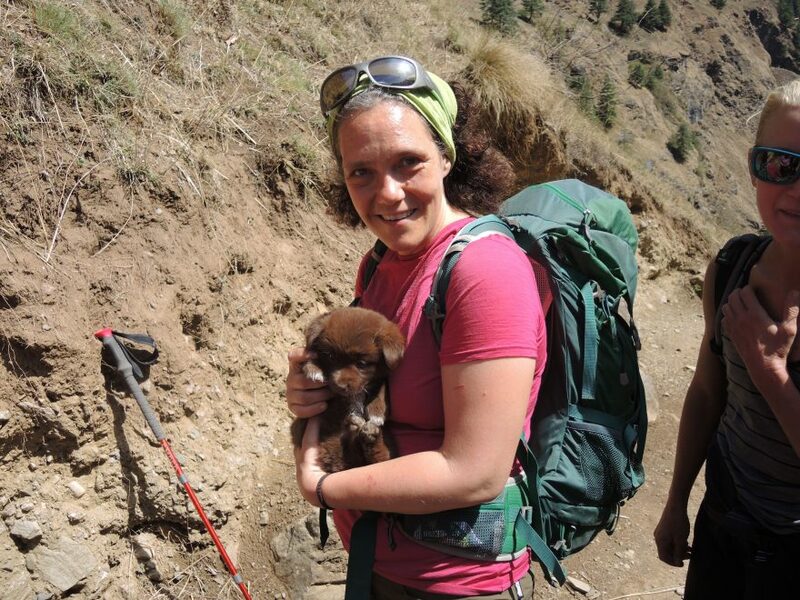 Unfortunately, her expedition was canceled in 2014 after an avalanche killed 16 climbing Sherpas in the Khumbu Icefall. In 2015, her expedition was canceled again when a 7.8 magnitude earthquake hit Nepal on April 25, 2015. Ingvill has experience from trekking in the Mount Everest, Annapurna, Ganesh Himal, Rolwaling, Langtang and Upper Mustang regions of Nepal, the Ladakh region in India and the Snowman trek in Bhutan. Besides Ama Dablam, Ingvill has summited multiple other 6,000 meter peaks, including Island Peak (6,189 m) and Lobuche East (6,145 m) in the Mount Everest region in Nepal and Lungser Kangri (6,666 m) in Ladakh, India. 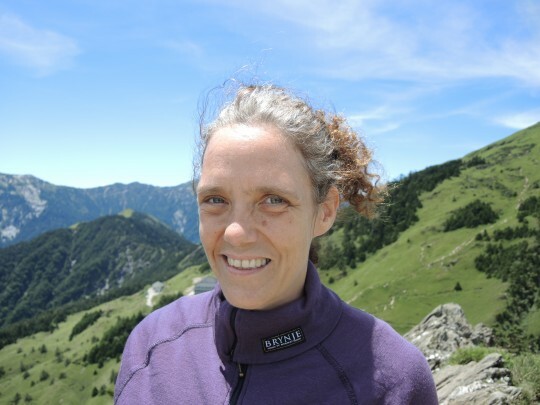 Ingvill has been fortunate to have learned about the challenges one can meet on expeditions through not only her own experiences, but also from experienced mountain guides. Ingvill holds a master degree in business and economics from the Norwegian Business School. She has 20 years work experience as a procurement and project manager at different companies and consultancy corporations in Oslo. For the last ten years before starting her journey, Ingvill worked for Skandinaviske Enskilda Banken. This equipment list is made based, in part, on my own experience from my journeys in Himalaya as well with the advice given by others on their equipment lists. All specific products and/or materials mentioned below are those, which I have had experience with myself and can personally recommend. In Norway, we have a tradition for using products made of wool for underwear and base layers, fleece or wool as mid-layers and a wind and waterproofed shell or down as our outer layer, all depending on the temperature and weather, of course. It has been my experience that using wool as the first layer is much more conducive to keeping warm in cold weather, as compared to under layers made of technical materials. Both this advice and list are based on my best tips. I am not sponsored by any of the brands that I recommend. These are strictly my recommendations for you if you have to buy new equipment for the trek. If you already have some or all of this equipment, then, of course, you use what you have. Note: If you do not have a sleeping bag, one can be borrowed from our local trekking agency partner for no additional charge. Note: A thin mattress is included in the price. The mattress recommended above is if you would like extra comfort on the trek. • Two pairs of trekking pants of your own choice. Even though our guests have been healthy on our treks, we recommend that you ask your doctor for prescriptions of antibiotics in the case of dysentery and Diamox, which is used to prevent altitude sickness. We will not use these drugs, unless it is necessary. 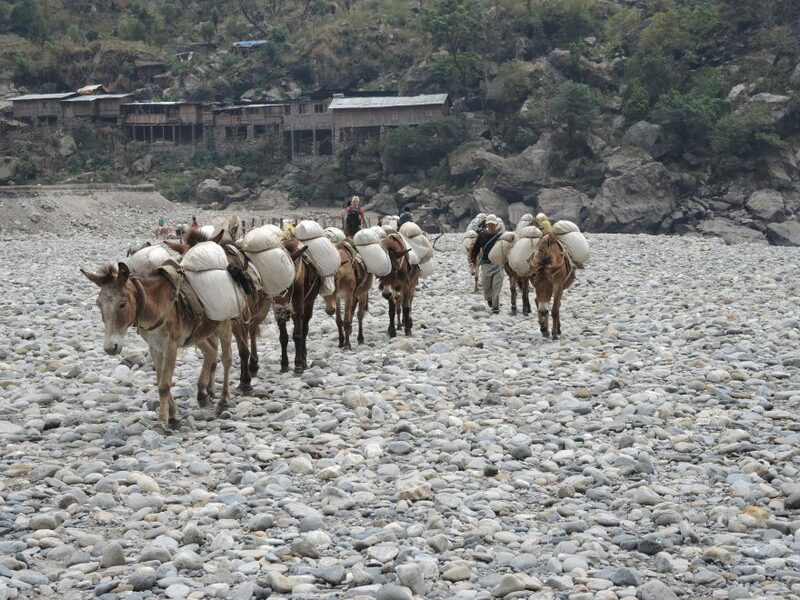 All equipment must be packed in duffel bags for the porters to carry them. If you do not have a duffel bag and want to borrow one from our local agent in Kathmandu, please notify us in advance of your arrival. 10 kg/22 pounds of luggage, per person, is included in the price of the trip. For an additional fee, it is possible to rent your own porter. It is possible to leave luggage that you to not need on the trek with our local agent in Kathmandu at no additional charge. A visa for Nepal can be purchased upon arrival at the airport. You will need two passport photographs and $40 USD in cash to apply for a 30-day visa.Your passport must be valid for at least 6 months and contain at least one empty page for the visa. Customers must arrange their own cancellation insurance. If you have taken out travel insurance for a full year, check whether cancellation cover is included before buying separate cancellation insurance. Cancellation insurance must be valid from the date of booking. Customers must arrange their own sickness, accident and travel insurance valid for altitudes of up to 5,500 meters above sea level. Check the terms and conditions of your travel insurance for such coverage. Many travel insurance policies limit the altitude to which they provide coverage. You may need to take out supplementary coverage. A copy of your valid travel insurance policy must be sent to the Arranger before the start of your tour. * for an additional fee, it is possible to get single room accommodation at the hotel in Kathmandu. Live A Life In Motion is a Norwegian-registered company. For this reason, Live A Life In Motion offers pricing and payment options for our treks in both Norwegian Kroner and U.S. Dollars to our customers from which to choose. Prior to payment, the customer and Live A Life In Motion agree upon which currency the customer will make his/her payment for the trek. All bank/transaction fees are the responsibility of the customer. 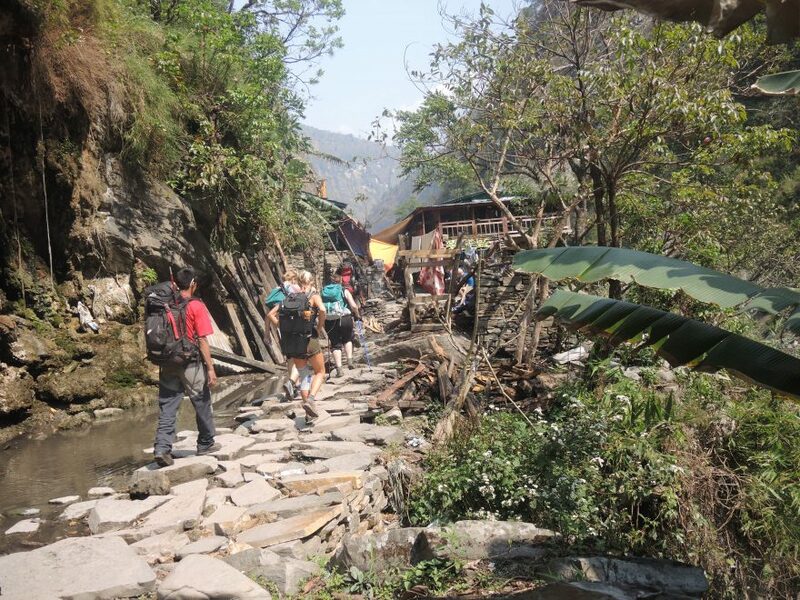 This trek is organized in cooperation with a local trekking agency that provides us with an experienced guide, cook, porters and camping equipment. 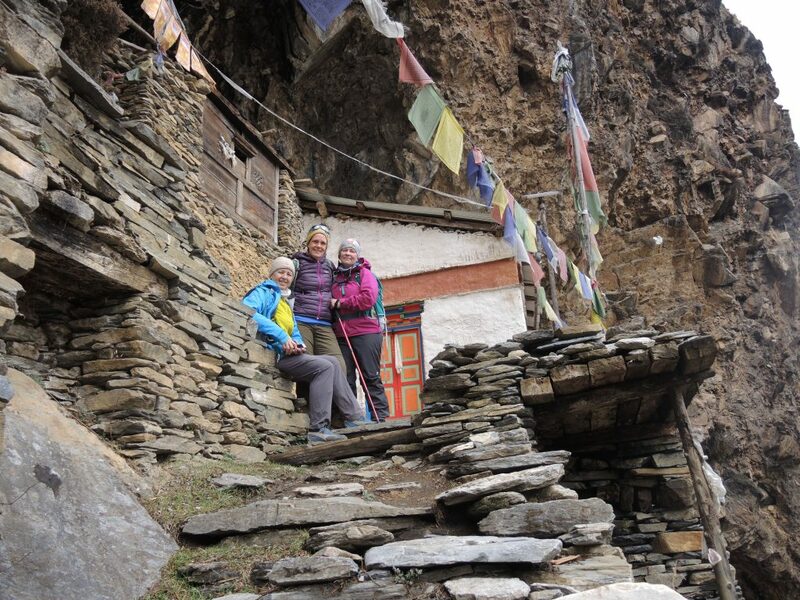 If you want to book this trek please send an e-mail to ingvill@livealifeinmotion.com.